Your carpet is releasing a bad odour? Wondering how to clean coffee stains off your carpet? Better Cleaning Company is an professional carpet cleaning Cockfosters EN4 company that assist you at an reasonable price. Our carpet cleaners are all trained and experienced to a top quality commercial and domestic carpet spot cleaning service in the area. Call 020 3746 3201 or send us a request online today. We will give you a non-binding and free price offer at any time. Affordable carpet repair offered by the best cleaners ! Better Cleaning Company is a top preferred professional carpet cleaning company in the region. We offer outstanding carpet repair services, affordable prices, easy booking system, clear pricing policy, availability 365 days a year, and high quality professional cleaning equipment and Prochem certified detergents. Our cleaning services are covered by insurance, and our skilled carpet cleaners Cockfosters EN4 can get all carpet types cleaned. Fibre protection Scotchgard can be applied after the deep cleaning, upon request too. We also offer a professional air mover if you want to make the drying process faster than the average 3 hours it takes for a carpet to dry after steam cleaning. 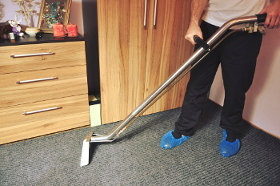 Both steam carpet cleaning and dry carpet cleaning Cockfosters are efficient cleaning methods which we offer you. Depending on the type of carpet and whether it has synthetic or natural carpet fibres we will either use hot water extraction or dry compound cleaning. The steam carpet cleaners and our dry carpet cleaners will use the method which is the safest and most efficient for deep cleaning your carpet, depending on its condition and type. Before the cleaning procedure begins they will evaluate your carpet, and test all solutions that will be used during the treatment. Then they will pre-treat any removable spots, and will hoover your carpet with a professional vacuum cleaner. Make the most of our user friendly 24/7 easy reservations system right away. Make a telephone call 020 3746 3201 or send us a request online here, and we will send you over our leading carpet cleaning experts in Cockfosters EN4 on any day you of the year. For your comfort we offer public holiday and weekend availability. We have fixed and quite affordable prices. We ask for no deposit for the reservation and you will enjoy a discount of up to 15% of every other service you order along with the carpet treatment. Estate agencies, regular customers, landlords and clients who reserve our cleaning services early on will all receive special prices. Make a free and quick booking today!